Every 28 days the Moon and Sun join together to begin a fresh lunar cycle. This is called the New Moon, and it gives us a chance to start all over again. While this doesn't wipe out the past, it does present another wave of energy and opportunity for those who choose to ride its rising tide. The New Moon in Leo is exact on Tuesday, August 6 at 2:51 p.m. PT / 5:51 p.m. ET, which is particularly auspicious for initiating creative projects. Leo, the sign of the heart, personal will and self-expression, is about imagining something that doesn't exist and turning it into reality. Find out how you to express your own artistic flavor with a Creativity Astrology Report. And remember, there are several sides to this mid-summer Fire sign that represent different ways of using its energy. Leo, the fifth sign of the zodiac, represents self-consciousness. It is the stage of development when we venture beyond the safe boundaries of home and family to show ourselves to the world. When we are confident we do this with an open heart, good humor and generosity. But when we're insecure Leo becomes bombastic and over-inflated. Perhaps this comes from being unappreciated as a child or as a result of previous failures. 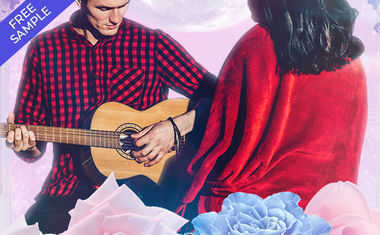 Yet even those with wounded egos (which are all of us to some degree) can benefit from this Leo New Moon because it is an opportunity for a fresh start. The beauty of Leo is its innocence. When we are discovering ourselves and coming up with bright ideas we tend to express them spontaneously. It is this childlike quality that can make life feel so bright and full of promise. Yet the shadows of the past can creep in to darken our souls with regret and even guilt. Forgiving ourselves and others for whatever has caused this self-doubt is a positive step toward tapping into the creativity of this New Moon. Imagine you're a super hero! Don't be held back by reality or reason, because this is an exercise in creativity that needs to fly free. 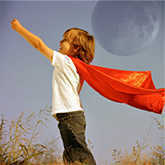 What qualities would you have as a super hero? Simply playing this game liberates you from the limits of adult thinking. The point of Leo, and of creative activities, is to amuse ourselves. The simple joy of making up stories opens minds and sets hearts free. Sure, much of what we dream up will never come true, but there are two clear benefits of this exercise. The first is simply to enjoy the pleasure of thinking outside the box. It's an exercise that's meant to grease the wheels of imagination so that other creative ideas will flow more easily. The second is that we may find inspiration in the superheroes we conjure up. If physical strength is part of the story, it's a signal to build up your body. X-ray vision indicates a desire to see more deeply and should encourage contemplation. Being able to fly shows a need to expand emotional, intellectual or material boundaries. The ability to conceive of new concepts and to share them with the world is a gift of the sign Leo and this New Moon. 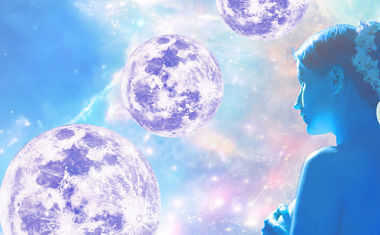 While the realities and pressures of daily life will not completely disappear, this lunation illuminates pathways to a brighter world that we often forget in the process of growing up. It's a reminder that we can create miracles in our lives when we reconnect with the playful child that exists within all of us.